The Great Smoky Mountains National Park offers visitors and locals alike an abundance of opportunities to enjoy the great outdoors. For those that enjoy spending time on the water, relaxing and casting a line, you’re sure to enjoy a visit to the Smoky Mountains. 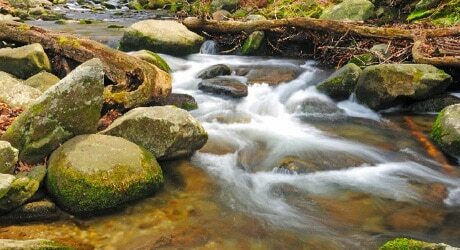 The Great Smoky Mountains National Park boasts more than 2,000 miles of streams within its boundaries, with nearly 600 miles of those streams containing fish. The park is also home to one of the last wild trout habitats within the Eastern United States. Fishing experiences within the national park range from remote, headwater trout streams to large, coolwater smallmouth bass streams. The Smoky Mountains National Park offers year-round fishing opportunities for a variety of wild trout species. Wild trout found in high elevation, soft-water streams include Rainbow and Brook trout, which are typically smaller (<10 inches) fish, and wild Brown trout which can grow to nearly 20 inches in length. Other angling opportunities within the national park include smallmouth bass, which are found in the large lower elevation streams including the first few miles of the West Prong of the Little Pigeon River and within the first mile of streams flowing into Fontana Lake near the park boundary. Fish as large as 2 to 3 pounds are commonly caught by anglers. State regulations for smallmouth bass: a daily possession limit of 5 smallmouth bass of at least 7 inches in length; only artificial flies or lures with a single hook may be used. 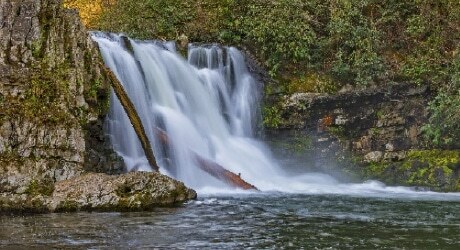 Best park streams for smallmouth bass fishing: East Prong of Little River (from where it enters the park near Townsend to the Sinks) and Abrams Creek (from its embayment with Chilhowee Reservoir to Abrams Falls). The following regulations must be observed by those fishing within the boundaries of the Great Smoky Mountains National Park. Fishing is permitted year-round, from 30 minutes before sunrise until 30 minutes after sunset. A valid fishing license or permit is required for fishing in the Great Smoky Mountains National Park. No trout stamp is required. Fishing licenses may be purchased online through the state government of Tennessee or at one of the local businesses in Pigeon Forge. Fishing is allowed within all streams of the national park. Pick up a free list of fishing regulations and map of fishable waters at any ranger station or visitor center such as, Sugarland’s Visitor Center. Visit our Smoky Mountains page for more information about the park and other things to do while visiting Pigeon Forge.